Is Crowley’s Presence as a Presidential Debate Moderator a Signal of Women’s Equality? That’s Debatable. ABC News’s senior foreign affairs correspondent Martha Raddatz was selected to moderate the vice presidential debate between Joe Biden and Paul Ryan, and Candy Crowley, CNN’s chief political correspondent, will moderate one of three presidential debates between Barack Obama and Mitt Romney. Although PBS’s Gwen Ifill moderated the vice presidential debates in 2004 and 2008, the last time a woman moderated a presidential debate was when Carole Simpson did it in 1992. The 20-year drought of women moderators prompted teenagers Emma Axelrod, Elena Tsemberis, and Sammi Siegal to launch a Change.org petition demanding that a woman be included in the slate this year, and it garnered over 120,000 supporters. 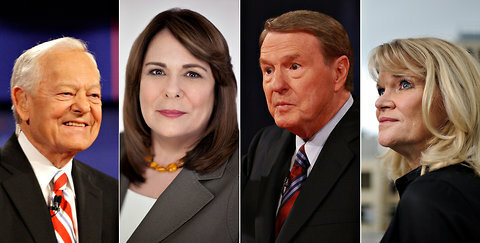 Although CPD officials declined to meet with the lead petitioners, the New York Times reported that Crowley beat out other leading contenders such as CNN’s Wolf Blitzer due, in part, to the commission’s “desire for diversity.” Sadly, as noted by The Feed’s Eric Deggans, diversity appears to be a zero-sum game when it comes to moderator slots. The presence of two women amplified the absence of other types of diversity on the panel. Ifill, an African-American with more direct experience moderating national political debates than Crowley or Raddatz, was omitted from the list, as were the nightly news anchors from the major networks and broadcasters from Fox News and Univision—not to mention print journalists, bloggers, academics, pundits, or members of policy think tanks. To judge whether or not equality has, in fact, been achieved, we must consider the format of each debate. The formats of presidential debates are both consequential and highly contested. Although journalists and voters clamor for debate formats that allow for a substantive exchange of ideas, the candidates typically negotiate short time limits for answers, preserving their ability to answer questions with simplistic sentiments plucked from their stump speeches. As Communication scholar Jay Self noted, in 2004, John Kerry’s and George W. Bush’s campaigns produced a 32-page Memorandum of Understanding governing everything from the format and choice of moderator to the staging to whom could be present in the audience during the town hall debate. This year, the campaigns agreed to three presidential debates. According to the guidelines posted by the CPD, the domestic policy debate (moderated by PBS’s Jim Lehrer) and the foreign policy debate (moderated by CBS’s Bob Schieffer) each will feature 15-minute debate segments and will cover topics determined by the moderator. Conversely, the debate moderated by Crowley will be a town hall debate in which citizens ask the questions and candidates’ responses are confined to the more traditional 2-minute time frame, with a 1-minute follow-up period. The CPD website makes clear that Crowley’s role will be limited to discussion facilitation, in contrast to the latitude given to Shieffer and Lehrer in selecting debate topics, formulating questions, and asking multiple follow-up questions during the 15-minute discussion period. Why did the CPD choose to assign Crowley to the debate in which the moderator is most constrained? In Politico.com’s blog The Arena, McCurry described the slate as follows: “We have two very experienced, seasoned, veteran journalists who have been around and have done it, and then we have two women in between who have both distinguished themselves in their reporting and the awards that they’ve won.” On one hand, McCurry characterized the moderator slate in toto as “arguably one of the strongest that the debate commission has ever had in moderators.” On the other hand, however, he awarded the title of “experienced, seasoned, veteran journalists” to the male moderators and referred to Crowley and Raddatz, simply, as “women.” His language belies the fact that the male journalists were held in higher professional regard by the CPD than the female journalists. Think Progress’s Alyssa Rosenberg argues that a more fundamental bias may be influencing the decision: “preserving the right of white guys to interrogate other white guys.” Rosenberg alleged that President Obama’s presence on the podium “is meant to represent African-American interests.” If true, that fact might explain why Ifill (whose status as a female African-American allowed her to serve as a convenient “two-fer” in previous debate cycles) was overlooked this year. Regardless of the rationale informing the commissioners’ decision, the absence of a woman moderator from the two debates in which moderators control the questions is consequential. Some of the most fundamental distinctions between Obama and Romney are expressed in their positions on health care and reproductive rights—matters of policy with unique implications for women. 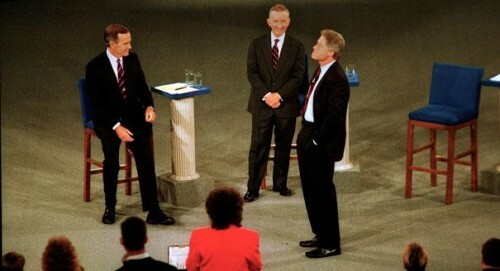 A conversation about those issues will be markedly different if it is occurring between three men (Lehrer, Romney, and Obama) versus a conversation between each candidate and a female moderator. In addition, consider the measures by which a moderator is judged in a traditional debate versus a town hall debate. American Studies scholar Robert P. Watson, castigated Carole Simpson for her efforts in moderating the 1992 town hall debate, arguing that she was too intrusive when she interrupted the candidates and citizen questioners in an effort to clarify the discussion. Conversely, however, Watson derided Donald Van Boskirk, who moderated the first recorded presidential debate between candidates in a Republican primary, for “manag[ing] to stay completely out of the way and allow[ing] the candidates to speak at length in an unfettered manner.” Watson’s conflicting pronouncements suggest that in the traditional debate format, the moderator is supposed to take an active, authoritative role, whereas in the town hall debate format, the moderator is tasked with facilitating discussion as unobtrusively as possible. In 2012, then, Crowley will be judged according to her ability to fade into the background of the debate, whereas Lehrer and Shieffer will be rated on their ability to hold candidates accountable. Additionally, if women are never given the opportunity to prove themselves as moderators in more traditional formats, male moderators will perpetually be judged as more experienced than women in that context. Equality is not simply a matter of inclusion. It is a matter of regard. When women are regarded as equals to men, their inclusion in important democratic events will be routine—not something that must be agitated for through petitions and negative publicity. Communication scholar Kathleen Hall Jamieson explains that, more than any other genre of campaign communication, debates are instructive for voters. The crucial give-and-take between and the candidates and a moderator yields unique and valuable insights about the candidates and their policy stances. But debates also educate citizens about the degree to which women and individuals of diverse ethnic backgrounds, religious associations, and ideological convictions are valued in a democracy. The process of planning the 2012 presidential debates reveals that in journalism and electoral politics, women’s equality is still being debated.